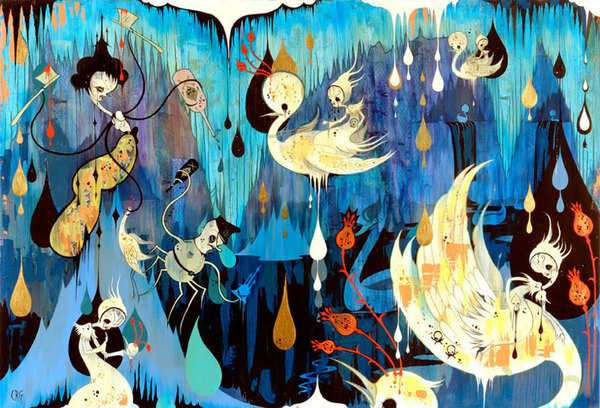 Camille Rose Garcia is a pop surrealist artist who creates frighteningly beautiful works of art through illustration, paintings and print. 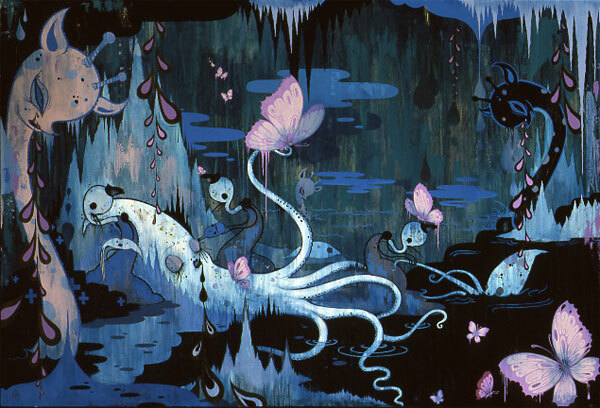 Garcia’s artwork contains a huge influence from vintage Disney cartoons due to her upbringing near Disneyland and her fascination with Walt Disney himself. The majority of her works contain a very vintage antiqued theme of creepy mythological creatures, disturbing humanoid insects with lush dreamy landscapes. 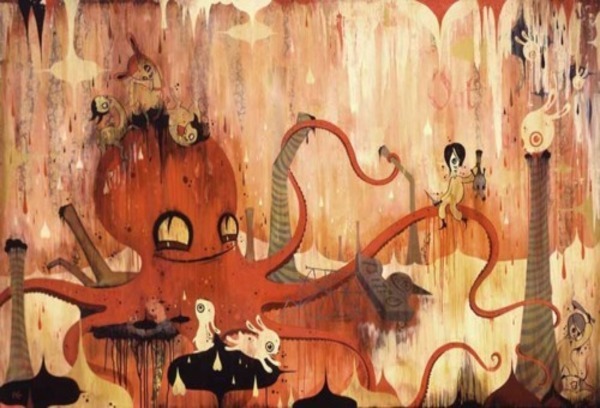 Garcia’s artistic vision shares a similar resemblance to vintage cartoons like Betty Boop, Popeye and Felix the Cat. I remember when I was younger my father would come home with these cartoons on VHS tapes and we would watch them together. There’s a feeling of sentimental nostalgia that takes over me when watching those videos and Camille Rose Garcia’s artwork is a welcomed reminder of those memories. 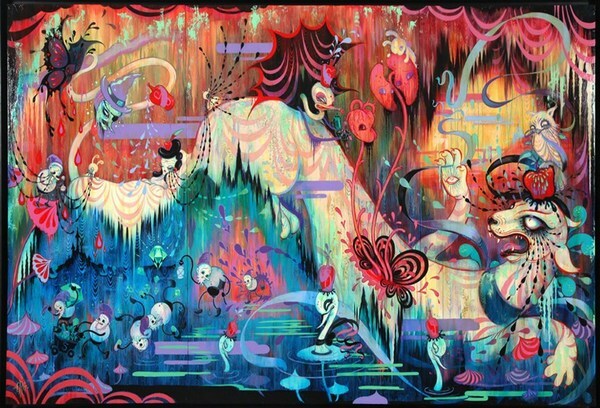 What I find so incredible about Garcia’s art is her ability to create these contradictory pieces of illusion. 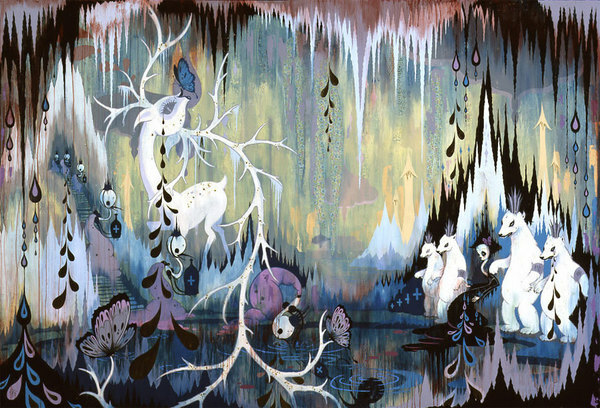 On surface, her illustrations look to be morbid visions with ominous imagery but the effect of beautiful color schemes and the sweet usage of flowers, butterflies and forest critters creates a fantastic world of adventure and possibility, much like a dream.